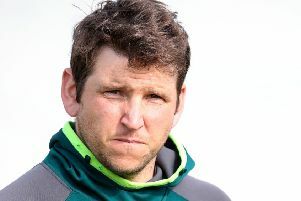 The careers of two veteran Waringstown cricketers could be over after a Northern Cricket Union (NCU) disciplinary panel handed them long suspensions from the game. Cousins Alan Harrison and Ian Morrison have both been banned from all cricket in the NCU until next season following an incident at The Lawn last month. Morrison is suspended from all cricket until June 15, 2018 while Harrison’s ban extends until May 15, 2018. The altercation between the two players, who both have long, unblemished records of behaviour in local cricket, took place in a Junior One fixture between Waringstown’s second and third elevens on June 24. Both were charged with Level 4 offences and the suspensions are among the heftiest ever handed out by the NCU in its long history. Blows were exchanged between the two after Harrison dismissed Morrison in a game that Waringstown seconds won by 100 runs. Both players, who made up minutes after the incident, may now retire from cricket.